After leading the market higher for most of 2018, it's been a rough month for the tech sector. Since the calendar flipped to October, the popular SPDR Technology Select Sector ETF (XLK - Get Report) has shed almost 9% of its market value, unwinding more than half of the sector's year-to-date performance. It's not just the abruptness of the tech selloff that's been jarring for investors - what's also notable is just how many big tech names have violated key technical levels on the way down. Simply put, lots of tech stocks aren't working anymore in the corrective environment we entered this month. That's the bad news. The good news is that a handful of big tech stocks are still showing bullish trajectories despite the drop. To spot them, we're turning to the charts for a technical look. Leading things off is Microsoft Corp. (MSFT - Get Report) . Despite not being part of the FAANG group of leading tech stocks, Microsoft has shown investors some outstanding momentum in 2018. Year-to-date, shares of Microsoft are up almost 27% on a total returns basis, leaving the rest of the broad market in their dust. Now, October's correction looks like a stellar buying opportunity as Microsoft successfully bounces off of trendline support for the fourth time in 2018. 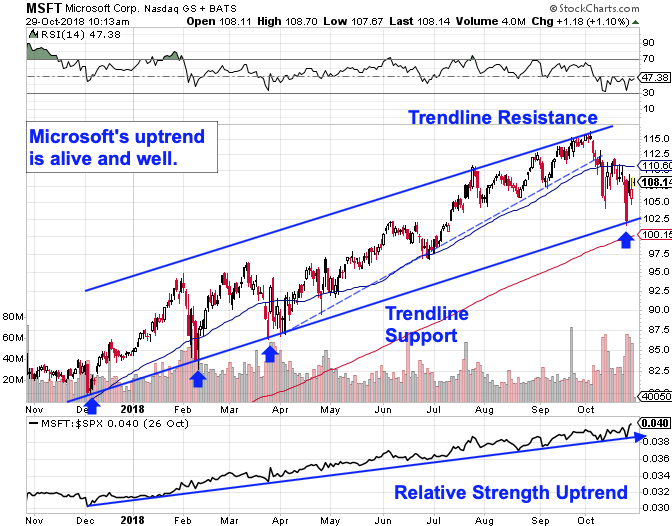 Relative strength, the indicator down at the bottom of Microsoft's chart, has been in an uptrend of its own, signaling that shares continue to systematically outperform the rest of the broad market right now. Despite the downturn, Microsoft looks primed to outperform in the intermediate-to-long-term. 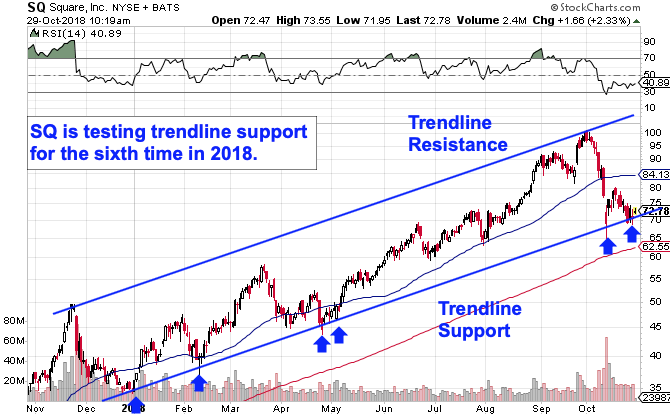 Like with Microsoft, you don't need to be a trading expert to figure out this stock's price trajectory - instead, it's pushing up and to the right in a very well-defined uptrending channel. Shares successfully held trendline support earlier this month during the first wave of the correction, and now it looks like Square is catching a bid at support again. The exact same price setup is in play right now in shares of HP Inc. (HPQ - Get Report) . It's not surprising that three tech stocks are showing off the exact same technical setup as correlations spike. In all three cases, though, it makes sense to "buy the dip" after buyers assert themselves on a test of trendline support. That's what's happening Monday. Risk management remains key here. If you decide to buy Microsoft, Square, or HP here, it makes sense to park a protective stop on the other side of their respective trendline support levels. Simply put, if any of these three tech stocks violate their uptrends, you won't want to own them anymore. Meanwhile, these three tech names are among the few whose technical trajectories still look attractive in 2018.